My Uncle Rob and Aunt Becky had their second child – my cousin Justin – in the last few days of 1982, so my family began 1983 with a trip to western New York. 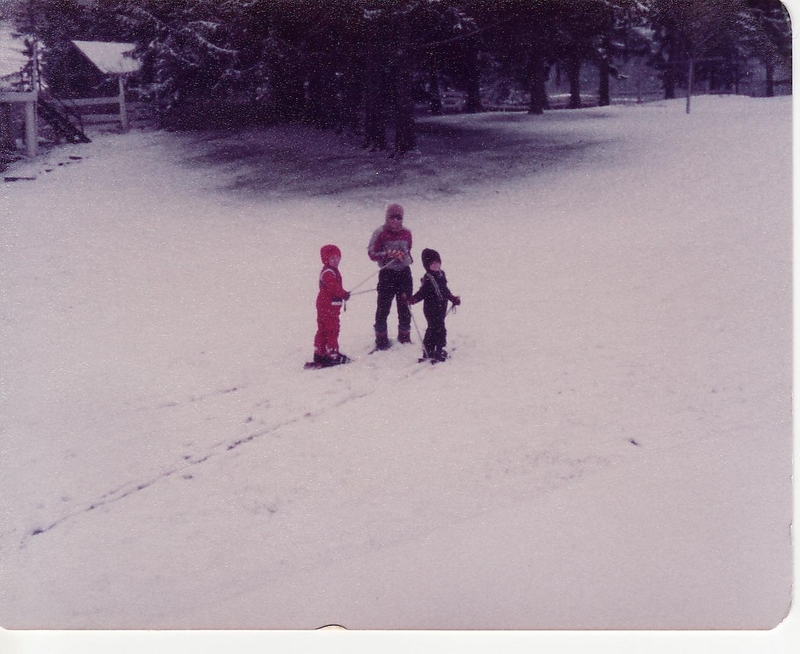 That’s me in the middle, and my brothers, who are on skis. My glasses were of the oh-so-cool-automatically-darkening-outside variety. I don’t remember if this was in Olean or Portville, New York, although there are photos of us eating pizza from the Portville Snak Shak: the restaurant which introduced me – on a later trip, I think – to the deliciousness of buffalo wings. My grandpa had made the trip from Ohio, too – I don’t remember if he drove separately, or if grandma was there, or if we all traveled together – and I think I remember him playing pool with Dad and Uncle Rob in a basement room of my aunt and uncle’s house. This trip was either during the last weekend of winter break, or possibly a bit into January ’83, since I didn’t go back to school immediately due to the Lake Local teachers’ strike. Since I’m off tomorrow, the smart thing to do would be to kick off Week Four with another 3- or 4-miler, so I’m not looking at another five-day break between runs. We’ll see how smart I feel in the morning. Yeah. So the next day (Tuesday, Jan. 22) marked the start of a really cold and windy snap, with highs in the teens and near (or below) zero wind chill temperatures each morning. I didn’t run any weekdays. 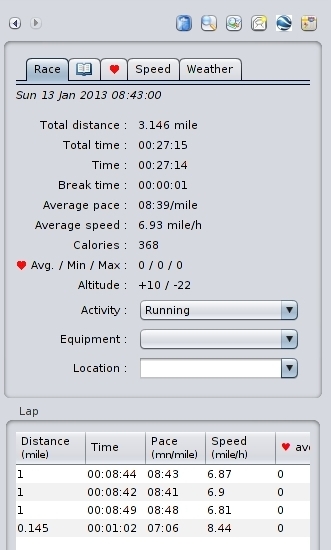 Decent enough start, predictable slowdowns in miles two and three, but enough of a kick over the last half-mile to keep my overall pace under nine minutes. And yes, to some degree, I realize that pouring it on at the end isn’t really, you know, pacing, but hey. One of the nice things about these low-mileage runs is that a good final kick can knock a significant bit off the cumulative pace time. 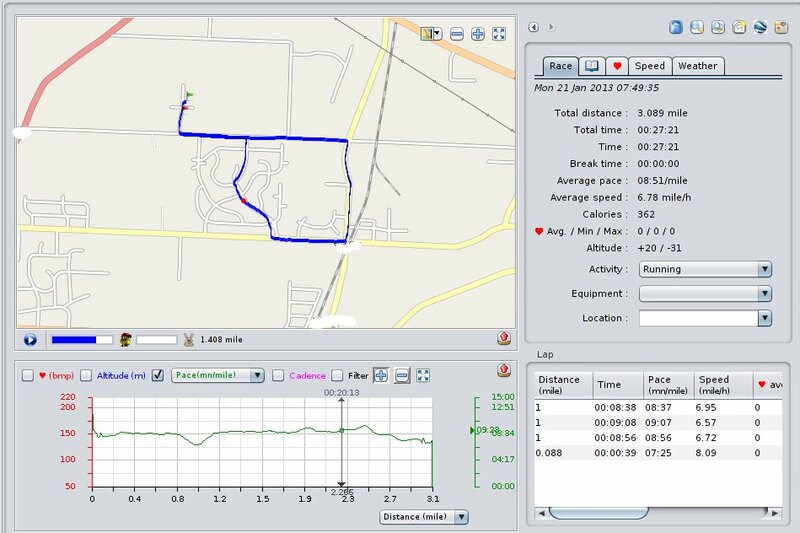 The first mile is good – as you can probably figure out, though, from looking at my pace line, it finishes with a big downhill stretch. Mile two was about the same as Saturday, and mile three was a bit faster. I really went after it in the last half mile, though – briefly hitting a 6:25 pace – and during that stretch, my cumulative pace dropped by a full 11 seconds. That left me feeling better about progressing, however slightly, even during what looks to be a fairly predictable two-runs-per-week schedule until spring gets here. 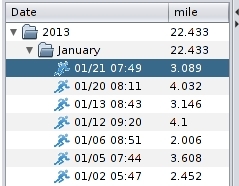 Today’s the 27th, so I’m 2.48 miles ahead of my mileage goal. 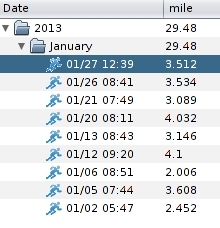 I’m likely to finish January with these 29.48 miles, unless I go crazy and get a run in before Friday. Since New Year’s Day fell on a Tuesday, my running weeks this year are measured Tuesday through Monday – at least until I find myself on a race training calendar. 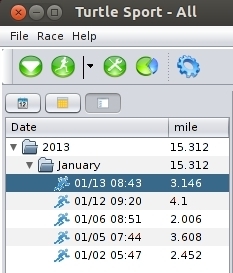 Three weeks in, I’m still a bit ahead of my mile-per-day average goal, although so far, the only weekdays I’ve put in mileage have been Jan. 2, when I got up and ran before work, and today, which is one of two vacation days I’m taking this week, since I have some time left to use before my work calendar resets. 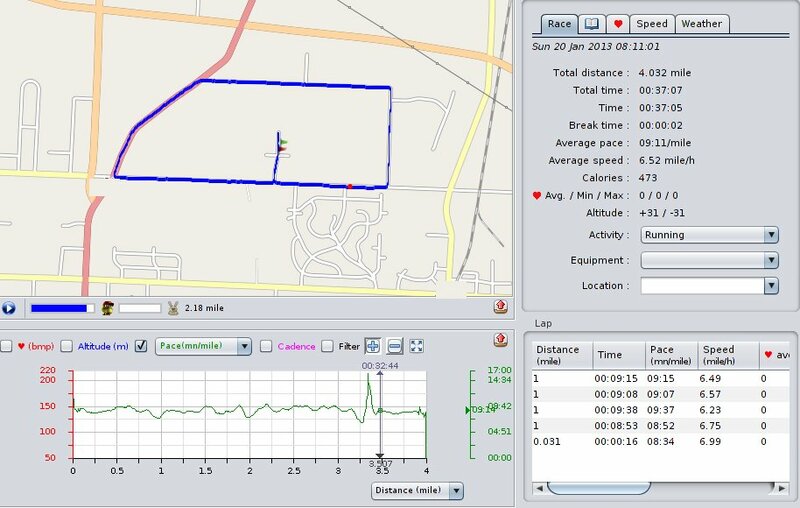 I did four miles on Sunday, and it was harder than I had hoped it would be. Maybe it was the wind or the cold (it was just below freezing), or the fact that I’m still re-establishing my running habit, but I really felt like I was working awfully hard just to hit a 9:11 pace. 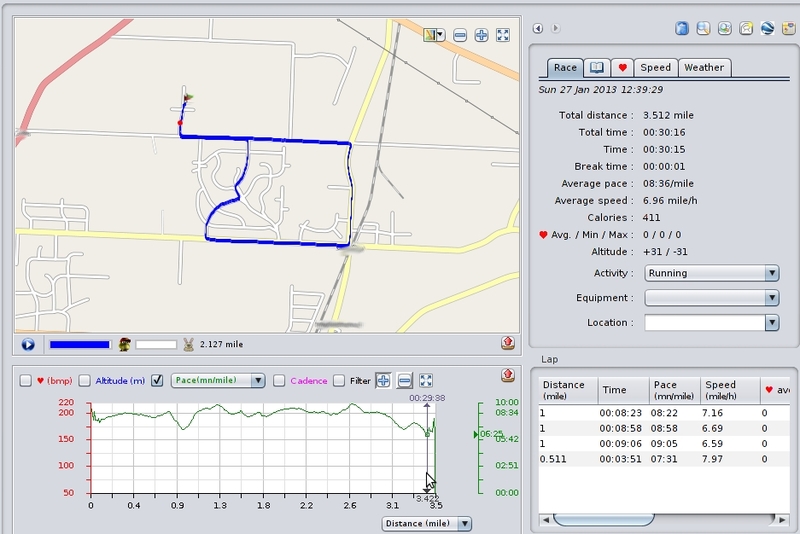 The spike in my pace chart below is where I stopped to tie my shoe – right after I’d come down a steep hill and hit my peak speed. 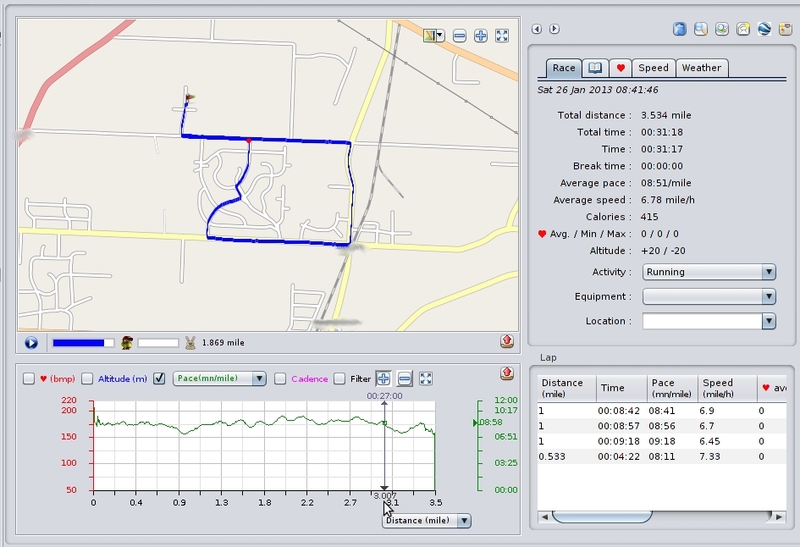 This morning, I did just over three miles, and felt somewhat better. It was significantly colder – around 20 degrees – but there was hardly any wind. I still had to push the last mile to bring my overall pace under the nine-minute mark, but I was able to sustain the kick for the last three-quarters of a mile or so. I realize it’s very early in the year, but it feels apparent that if I really want to rebuild my pacing, I’m going to need to drag myself out of bed before dawn at least one day a week, even if it’s just for a couple miles. Since I’m off tomorrow, the smart thing to do would be to kick off Week Four with another 3- or 4-miler, so I’m not looking at another five-day break between runs. We’ll see how smart I feel in the morning. 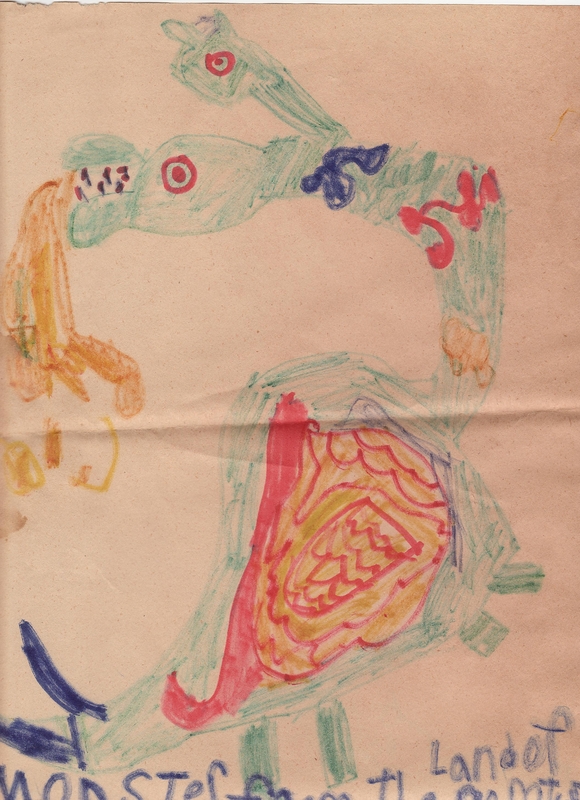 This is Me in ’83 – Introduction and Part One. Over the Christmas / New Year’s holidays, inspired in part by Alison Haislip’s AliMinus20 Twitter feed , I started thinking back to thirty years ago: 1983. The original Star Wars trilogy concluded that year. So did M*A*S*H. Jaws 3-D and A Christmas Story both came out. I wasn’t really into listening to music yet, but that year saw the release of “99 Luftballoons”, “It’s a Mistake”, and “Every Breath You Take,” all of which I eventually owned on cassette, either as part of the entire purchased album or recorded off MTV using a boombox placed in front of the family room television. I’m pretty sure sixth grade was the year I finally made it all the way through reading The Lord of the Rings. And in November 1983, I became a teenager. Point is, it seemed like it’d be a fun year to revisit through pictures and memories and whatever else I can dig up. And as Doc Brown says, 30 years is a nice round number for time traveling. 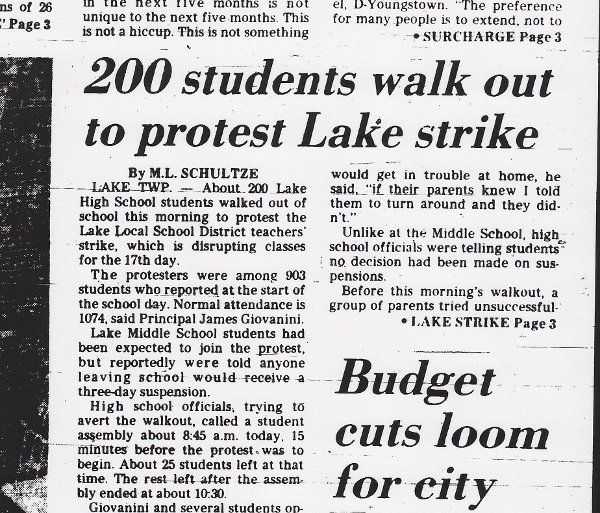 Lack of personal photo documentation aside, 1983 did get off to an interesting start: The Lake Local Schools teachers’ union went on strike on January 3 – our first scheduled day back at school following the Christmas break. My parents kept me home – whether out of support for the teachers, or due to a lack of available busing (this would be less of an issue as the strike continued), I’m not sure. But I remember thinking it was great having an extended winter vacation. I’m not sure how long it took – a week, maybe? Week-and-a-half? – for mom to get it into her head that I should be doing school-type stuff instead of playing Atari and watching cartoons – but I know that the day she assigned me to write a book report was the last I stayed home. By that point, several of my friends had gone back to school, where substitutes teachers were filling in. I don’t remember being nervous about walking past the teachers picketing in the parking lot or anything like that. I remember that it felt weird to be back, since a lot of the kids were still staying home, and since the substitutes were kind of more or less winging their lesson plans, which had little to do with whatever it was we’d been working on in December. I remember that day: And yes, I seem to recall having the Fear of the Permanent Record being put into us as far as the penalties for participating in the walkout. There were adults stationed at the building exits, sitting at student desks which had been moved into the hallways for the occasion. In one of my classes, the teacher took attendance and, reaching a gap in the roll, asked if anyone had seen the absent student. “He excaped!” one of my classmates blurted out with vicarious glee. I believe a couple of the older kids on our street – high schoolers – did participate in the walkout. The strike ended on Feb. 15. Pictures in the newspaper archives showed the teachers wearing their “TOGETHER WE CAN DID!” buttons, which I had forgotten about. The paper noted that 28 teachers had been arrested over the course of the strike. 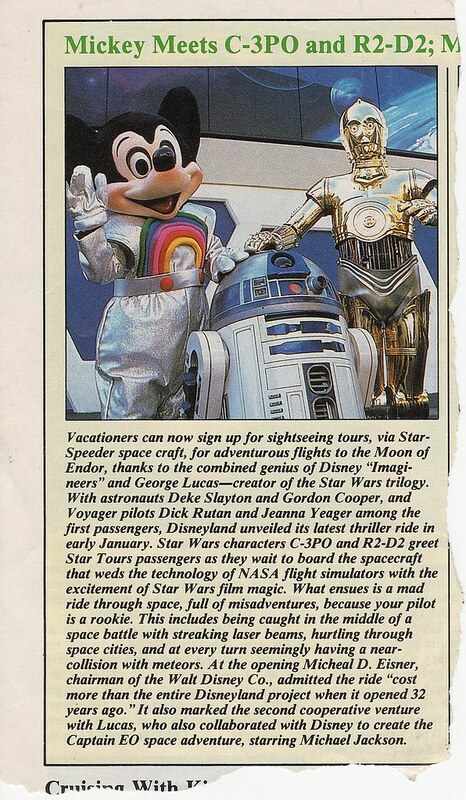 I have a vague memory of the whispered buzz about this side of things. That’s Incredible anchored my Monday night prime-time viewing. The Toy, Airplane II: The Sequel and The Dark Crystal were all still in movie theatres. I love it: It feels genuine.